There is a simple explanation as to why Transcendental Meditation can work when other rehabilitation programmes fail. With the current state of scientific research, it is possible to see why prisons and most rehabilitation programmes have limited effect and why the experience of transcending, obtained when practising Transcendental Meditation, can be so successful in rehabilitating prisoners. It is now known that a specific part of our brain is responsible for higher thought-functionality, such as long-term planning, moral reasoning and deciding whether something is right or wrong. This is the frontal part, right above our eyes, also called the pre-frontal cortex. This part is sometimes also referred to as the managing director or “CEO of the Brain“. The pre-frontal cortex is one of those aspects of the human brain that differentiates the human from the animal. In a brain that functions normally the flow of information is as follows: information enters via the senses, is sent to the pre-frontal cortex and is processed there and decisions made are then sent to the motor parts that drive the relevant muscles to respond. In a state of stress, this flow of information changes. Information by-passes the pre-frontal cortex and flows directly from the senses to the motor parts. There is a good reason why our brains have eve loved in this way. When, for example, we cross a street and see a car approaching rapidly, we need to react fast without undue reflection. There is no time to think. We need to jump out of the way immediately, impulsively. This mechanism exists to protect us in when threatened. However, this mechanism was not intended for situations of chronic stress. When people are continuously subjected to stress, their brains become dominated by Survival Oriented Behaviour (SOB). Survival Oriented Behaviour is activated by a sense of threat and elicits the stress response, which immediately switches on primitive survival centres in the mid-brain. An important discovery is that this reaction causes a suppression of higher brain centres, where the intellectual and creative resources are seated. As the pre-frontal cortex is disabled, thoughts become short-sighted, impulsive. Current approaches to crime prevention centre on educating people about what is right and wrong and threatening punishment for infractions. This may work to a certain degree but, for someone subject to considerable stress, this may make little difference. If the higher intellect (pre-frontal cortex) is disabled. The person acts impulsively. He or she is no longer able to see what is right or wrong or to consider the possible long-term consequences of actions. Violent behaviour is in the brain, and can also be prevented there. That’s important. This is the higher brain. It separates us from the primitive species. It’s called the CEO or executive centre. It sits over the primitive brain. It exerts executive control. It’s responsible for higher human function – judgement, planning, moral reasoning, control of the attention. And what we see, in the presence of stress, is that the pre-frontal cortex shuts down. And, under chronic stress, it shuts down chronically and it fails to develop properly. And we really are living to a good degree in an underdeveloped world, a world of arrested development. Just look around. Look at TV. Listen to the news. However, there is a solution. Transcending is a state in which the body enters a deep state of rest. This unique level of rest allows the body to begin dissolving the deep-rooted stresses, while, at the same time, activating the frontal brain. Blood flow increases, leading to more coherence and more activity in general. This can be measured, for example, with neural imaging scans. The activity in the thalamus (related to bodily functions) reduces, while activity in the frontal cortex increases. 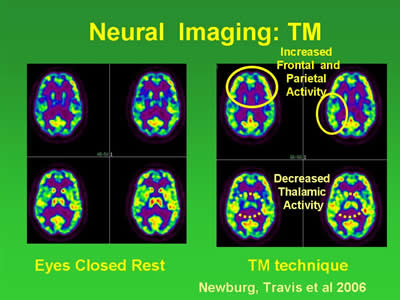 These changes in the brain are unique to the TM technique. With other meditation or relaxation techniques, these changes do not occur at the same speed and to the same extent. Even “functional holes” in the brain see recovery as the entire brain is engaged and as blood flow returns to the total brain. Then, we see that, even in maximum-security prisons, where stressed brains are so common, a marked reduction in the rate-of-return to prison by prisoners who have had this experience of regular transcending. With regular practice of the Transcendental Meditation technique, the pre-frontal cortex will continue to be more active during activity. Prisoners, who generally suffer from high levels of stress, will, spontaneously, tend to be less impulse driven and better able to consider his or her actions. Spontaneously, he or she begins to do the right thing. Similarly, the coherent functioning of the brain plays an important role in more orderly functioning of mind and body. This can be measured by EEG coherence, a measure of the extent to which the brain works coherently as one whole. Researchers have linked levels of EEG coherence to levels of spontaneously, ethical behaviour. The practice of TM has been demonstrated to produce an exceptionally high and long-term level of EEG coherence (see Brain Development). The development of personality, also called self-actualisation, also plays an important role in the rehabilitation of prisoners. Self-actualisation, an umbrella term for self-confidence, self-acceptance, and the ability to live in the present and to maintain better relationships with others, normally stops developing around early adulthood. The American psychologist Abraham Maslow, who developed the concept of self-actualisation, described “peak experiences” that could cause spontaneous growth of self-actualisation. His description of these peak experiences closely matches the description of the experience of transcending. TM practice has been shown to have an exceptional effect on the growth of self-actualisation. The effect was so impressive that “maximum security” prisoners in Walpole Prison, Massachusetts, USA, after a few years of TM practice, reached higher levels of development than those achieved by Harvard University students after 4 years at college. Research also indicates the significant role Transcendental Meditation practice can play in helping overcome addictions. There is a strong body of scientific research on the impact of the Transcendental Meditation programme on prisoners. This research shows very positive outcomes – see Research on Transcendental Meditation in prisons – with a clear reduction in stress among prisoners, as measured through various variables. This has a rapid and positive effect on behaviour within the prison as well as a significant decrease in recidivism once detainees leave prison. Decreases in recidivism documented in studies on Transcendental Meditation prison projects were particularly large. In Senegal, during the currency of a project in which 10.000 prisoners were taught the Transcendental Meditation technique, some prisons were shut down. Building new prisons and keeping prisoners is extremely expensive. In 2013, the average daily custody rate in Irish prisons came to just over 4,100 persons. These were serviced by a staff of over 3,400 with an annual budget of €330 million. Irish prisons have high recidivism rates – the latest CSO study showing a rate of 51% for a 2008 cohort of prisoners. This revolving door system represents both a waste of life and a waste of increasingly scarce State resources. It does’t have to be like this. Effective rehabilitation is possible. The evidence is there. Transcendental Meditation can be the foundation. Building a simple and efficient system of rehabilitation, centred on the Transcendental Meditation programme, is the way to go.